What if communities formed new parks when they needed them? What if these parks could be formed by swarms of bicycles? If that sounds like something out of a sci-fi novel, get ready because landscape architect John Bela, ASLA, at Rebar and artist Tim Wolfer at N55 have created Parkcycle Swarm. 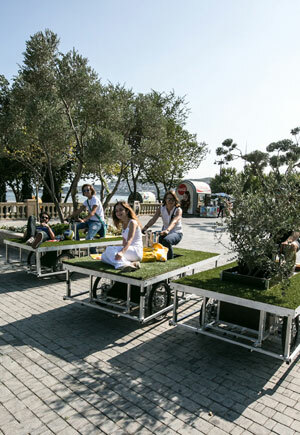 While this concept has been explored in a few locations in Europe, the team just created four small mobile parks for the Participate public arts festival in Baku, Azerbaijan.